Walking through the streets by the Grand Canal, watching the gondoliers float on by, hearing the soft Italian tunes playing; I’m off in my own Italian dream… then I’m brought back to reality by the bright shiny lights and noises of the slot machines ringing in the background. A little Italian adventure is just steps off of the Vegas Strip. Tucked back in the Shops at Palazzo, a tiny sweet shop can be found. 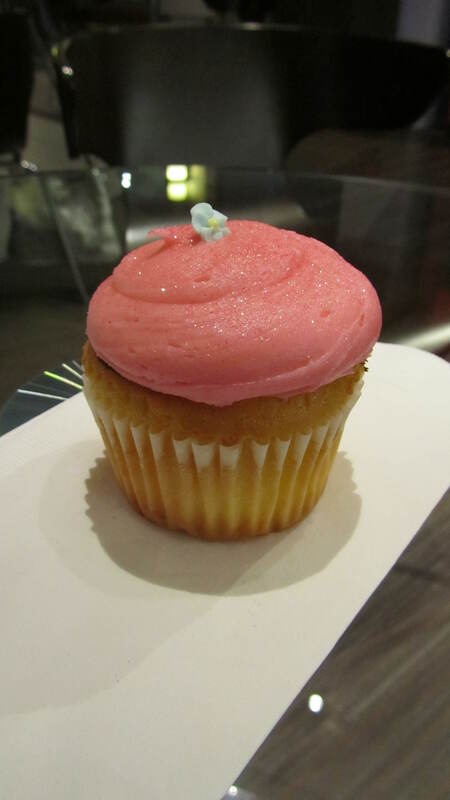 After peeling yourself away from the poker tables, give in to another weakness with a cupcake at Sweet Surrender. The cake was doughy in the very center. The tops were a bit too hard. There wasn’t any real flavor to it. The frosting was a really silky. If satin could be tasted, I’m positive this is how it would taste. However, there wasn’t any dominating flavor. It was supposed to be a vanilla crème flavor, but it tasted a bit bland. I couldn’t tell if the frosting was made out of butter, shortening, powdered sugar, or what. It was so whipped like it reminded me of the 7-minute frosting some grocery stores offer. This little cupcake looked like a little gem. 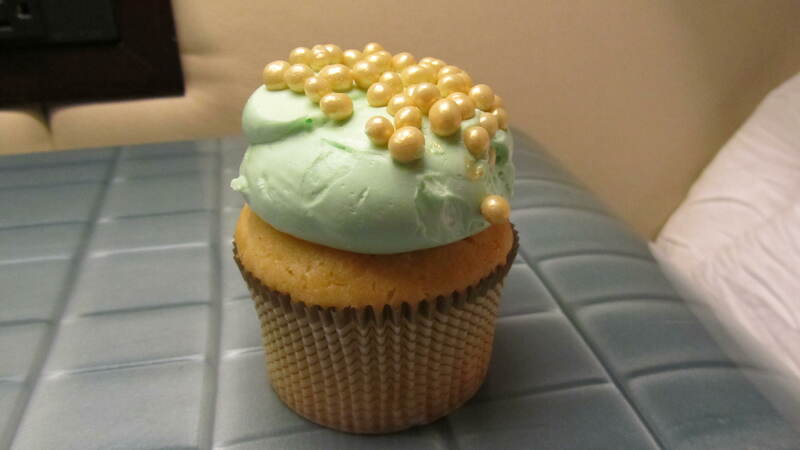 The blue-tinted frosting was a bright, shiny shade of blue and was topped with gold white-chocolate crunch balls. My goodness, those little gold things were delicious! I would do just about anything to get a whole bowl of those right now! For all the high rollers in Vegas needing to get their sugar fix, they can enjoy luxury with one of the most expensive cupcakes on the Strip, the Decadence D’Or. 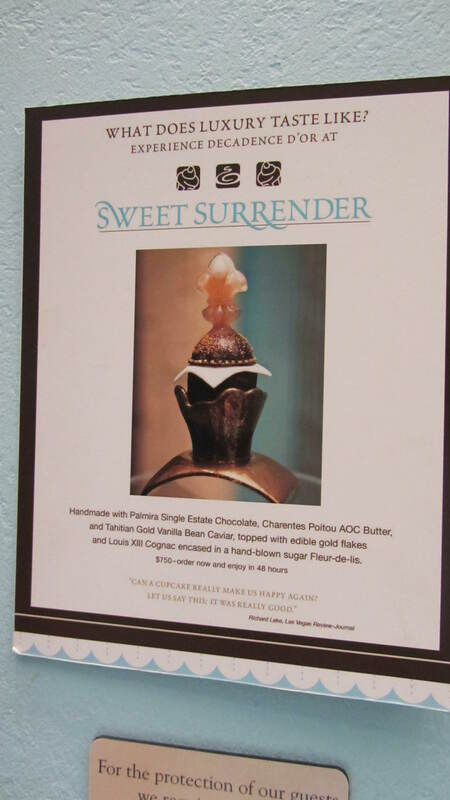 For $750, you can get a handmade cupcake with Palmira Single Estate Chocolate, Charentes Poitou AOC Butter, and Tahitian Gold Vanilla Bean Caviar, topped with edible gold flakes and Louis XIII Cognac encased in a hand-blown sugar Fleur-de-lis. Next time I’ll hit the tables and try my luck to fund this cupcake purchase. Or, if there’s anyone out there that would like to make a donation, I’d be much obliged. Besides the beauty of the cupcake, there’s not much else to brag about. My advice? Walk a few steps further along the canal and get you some gelato in the middle of St. Mark’s Square. In my second round of sampling Las Vegas’s finest cupcakes, I made it my mission to find a cupcake place on the strip. 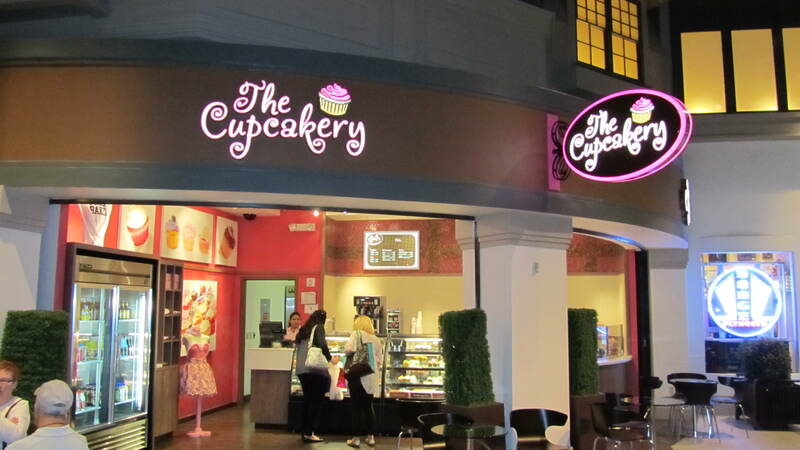 To my great pleasure and happiness, the Monte Carlo is home to one of Vegas’s local cupcake shops, The Cupcakery. Known as “the best little cupcakes in Vegas”, I was ready to try what they had to offer. Tickled me Pink, their signature cake, a white cake topped with pink vanilla buttercream was my cupcake of choice. The cake itself was cooked evenly throughout, but was too dense. Half way through, it started to taste dry. The frosting had a weird grainy texture. It wasn’t smooth and silky like most. The vanilla flavor was extremely dull and was way too sweet. This was one of the prettiest cupcakes I have ever laid eyes on! My cupcake was dusted with edible sugar that just glistened. All of the cupcakes in the display case looked like little art pieces. Sadly, these photos just don’t do it justice! However, I was extremely disappointed. I notice a dark brown edge peeking out from underneath the frosting of my cupcake. After scraping some of the frosting back, I realized that this was chocolate. It was as if they originally put chocolate frosting on top and realized that it wasn’t supposed to be chocolate. 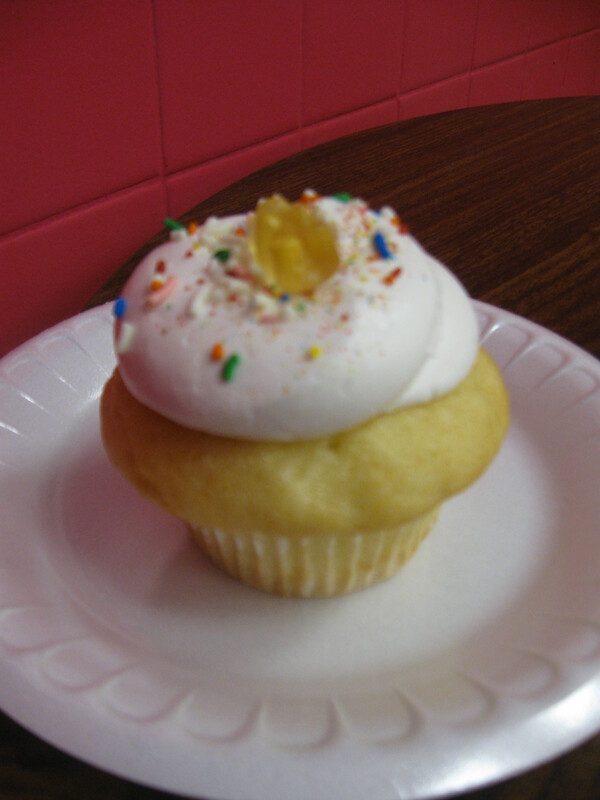 Instead of throwing the cupcake away (like most bakers would do), they scraped it off and replaced it with vanilla. I found that to be cheap and weak. As I mentioned, these cupcakes are gorgeous! I felt like I was eating a million-dollar cupcake. Although the price was a bit high, but then again what isn’t in Vegas?! But the cupcake fell short of its appearance. If you’re out in Vegas and need a little sugar pick-me-up, there are much better options for you. My second stop on my Cupcake Tour de Vegas was Gigi’s Cupcakes. Since I apparently didn’t think I had enough walking adventures the day before, I decided that the two-mile walk to Gigi’s was worth the trip. So, I doubled-up my socks in attempt to cover up my blisters and managed to somehow squeeze into my tennis shoes (there was no way I was just wearing sandals after my crazy escape to Cupcake Café). Again, this place didn’t look that far away on the map. Besides, walking two miles is nothing. However, walking two miles in another sketchy stretch in Vegas is not just “nothing”. But, I was bound and determined to make my way to Gigi’s, so nothing was standing in my way. Gigi’s was a ray of sunshine on this tiny strip mall. Upon seeing the store, I nearly ran to the front door. I was so excited to finally get to visit an actual Gigi’s store! 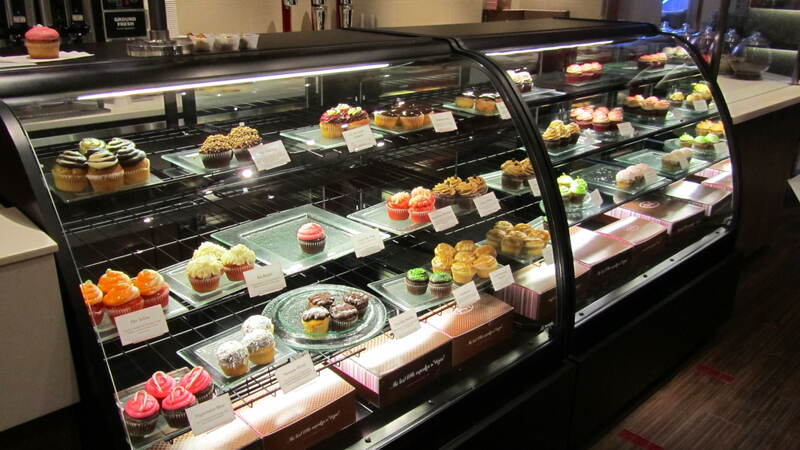 At first glance of the glass case, I was overwhelmed by the amount of frosting on each cupcake. Now, I’ve heard numerous reviews of how much frosting they put on their cupcakes, but I had no idea it was that much! I glanced through their menu and their cupcake offerings, but had a hard time deciding which one to get. 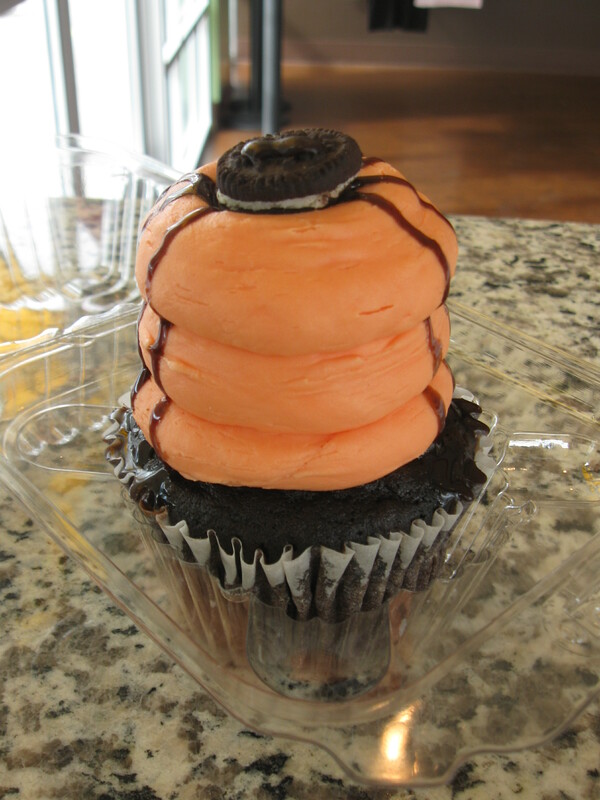 Since I have already tried some of their vanilla options, I decided to get crazy and get their “Trick or Treat” cupcake. Chocolate cupcake with chocolate chips with a orange-colored vanilla buttercream on top. There wasn’t any flavor to the frosting. It was very thick and piled high onto the cupcake. I swear the thing had a couple of pounds of frosting on top. I had to shave off a few layers of frosting to even find the cake. And, when I did that, the frosting just “plumped” over in a small gob. Seriously folks, this must have been three inches tall. Even though I am a HUGE fan of frosting, this one hardly had any taste. The cake was much better than the frosting. However, I don’t have much experience with chocolate cake, so I couldn’t tell you anything based on its flavor. It did taste airy and light, and I enjoyed the chocolate chips mixed throughout the cake. It added a fun bit of crunchiness and helped break up the thickness of the frosting. Gig’s gets an A+ on her presentation. Every cake looked so beautiful and well put together. One great thing was their uniformity. I believe that no matter when I go, what cake I get, or where I go, I’m going to get the same presentation quality as before. Sadly, I was disappointed in my second Gigi’s experience. One thing I wonder is how Gigi franchises her stores and have them all the same. Does she send out guidelines and rules they must follow? Does she ship out pre-made frosting with direct orders on how to frost? I’d be really interested in know how she makes sure that every store is alike. There might be two other reasons why I was disappointed. First of all, I had endured a long journey to reach the store. I didn’t have the time to fully enjoy them because I knew that I had a grueling two-mile walk back to my hotel. I was almost to the point “eat and let’s move on”. Secondly, my first experience of Gigi’s was when my gracious friends packed a box to bring me to Philly this summer. Those were some well-traveled cupcakes that survived the fourteen hour drive! 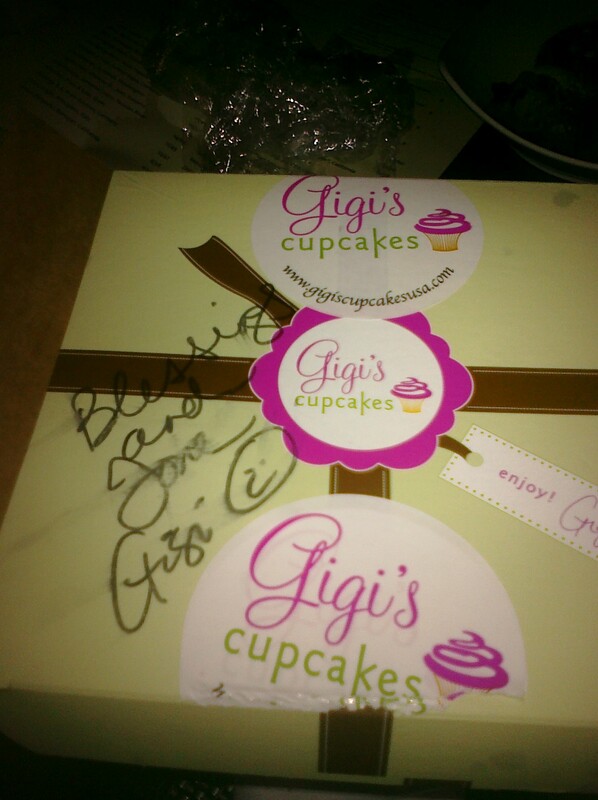 Also, my friends had run into the “Gigi” of Gigi’s Cupcakes and she signed my box. That was such an unexpected surprise! So, perhaps my current situation just couldn’t top my previous experience. This probably means that I will need to give Gigi’s one more try. Third time’s the charm, right? I think that my next visit must be to her original store to get the full experience! As for you folks out there, if you happen to have a Gigi’s close by, jump in the car and make a visit. Your eyes will be amazed. As for your taste buds—I’ll let you be the judge. 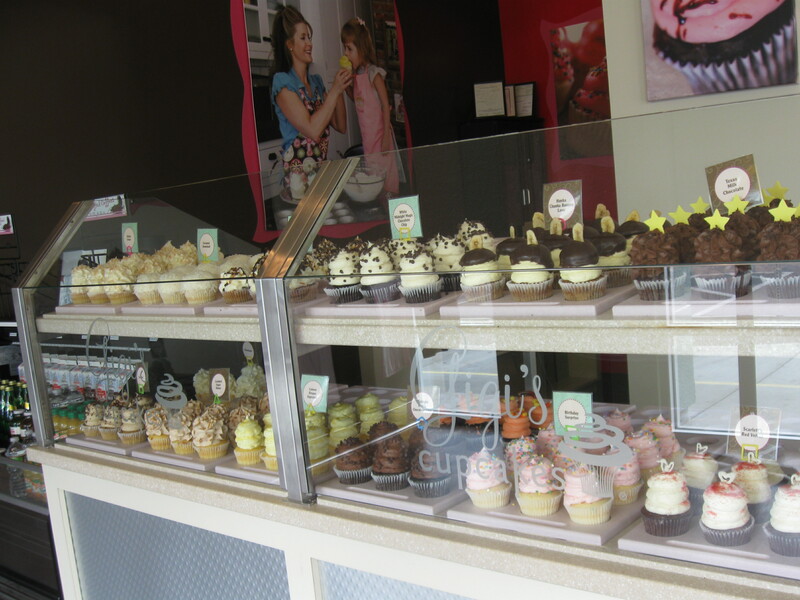 My first stop on my Cupcake Tour de Vegas was to Cupcake Café. As I mentioned earlier, this place was a bit of a distance away from the strip, but I didn’t think it would be too horrible. So, after satisfying by burning desire to hit up the outlet mall, I jumped a cab over to the Meadow Mall. My wonderful cab driver took the time to be patience with me as we attempted to find its location (well, of course she was going to be patient. I was buying her patience). After circling the block and with the help of technology, we realized the place was inside the mall. Hmm, very intriguing. This was your typical suburbia mall. 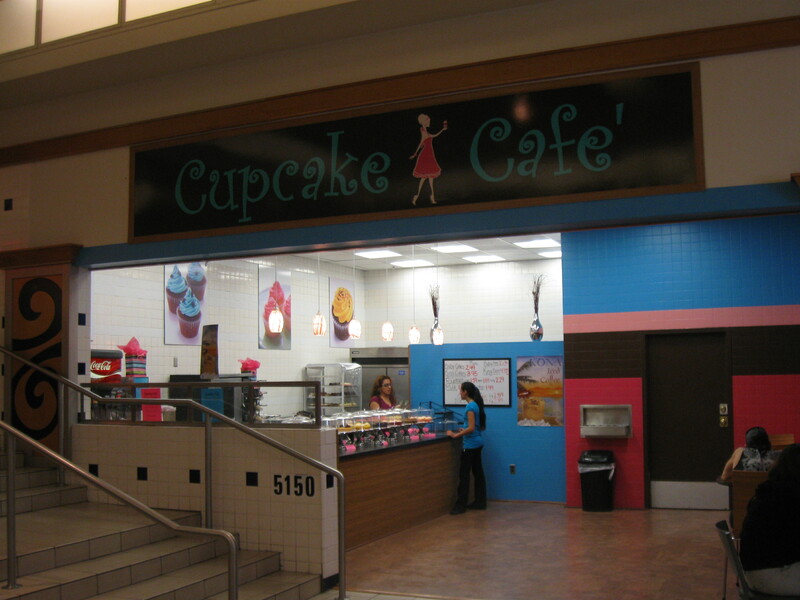 I wouldn’t normally peg a mall as a place to have a cupcake place, but then again, it makes sense. High traffic, lots of young folk, hungry shoppers, etc. Well, I was definitely in the same boat as most of the other shoppers. By the time I finally found the place, I was in a dire need of a cupcake. Quickly, I scanned the selection and, of course, chose the Vanilla-N-Cream cupcake. I sampled the frosting first and was met with a rush of sweet goodness. The frosting was so light and fluffy that it tickled my tongue. I couldn’t help from smiling and laughing while eating it! I’m sure the worker thought I was some crazy girl, but its velour, smooth sensation was great! The cupcake was just a bit subpar in this department. If it wasn’t for the overfilled cupcake, I would have thought it was very cute and nicely done. However, the cake looked sloppy and the frosting looked inadequate on top. The gummy bear was darling though! 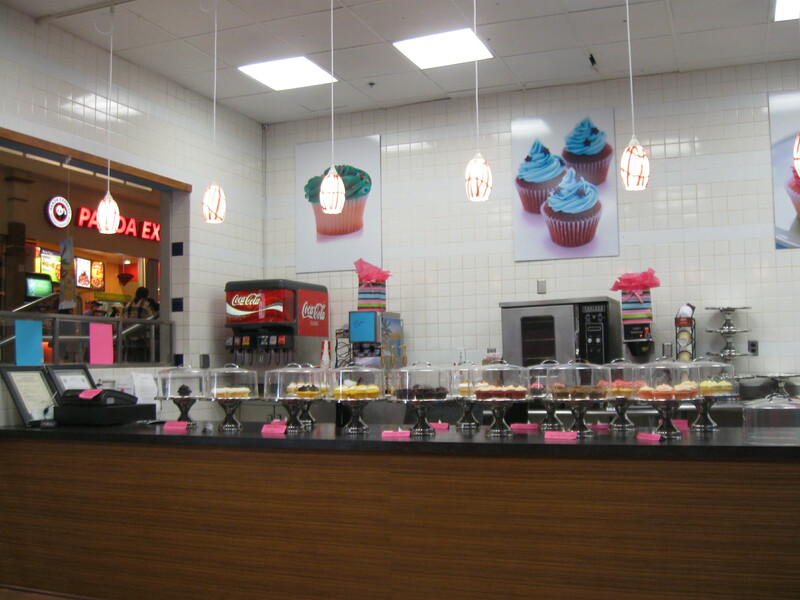 Would I ever make the trip back to Cupcake Café? Well, let’s just start with the fact that places in Vegas appear to be very close together. But in true Vegas fashion, this is just another allusion. As the soles of my feet can testify, this was indeed the truth today. I ended up walking back the four miles to the strip on my “already burning with sharp pain feet” in my “wooded sandals with no support”. I’m positive that I could find sweeter things much closer to the strip. Also, with a name like “Cupcake Café”, there are so many creative things you can do. I would have thought it would have had that “coffee café” feel… oversized couches, soft lighting, chill music, etc. Instead, this place was in the center of the food court at a shopping mall. Not really what I would consider “café-i-ness”, and it really fell short of its potential. On to round number two—Gigi’s Cupcakes! There are two things I really love— Vegas and cupcakes. I usually don’t get both at one time, but lucky for me, work sent me out to Vegas and I’m going out to find me some cupcakes. My initial search of a cupcake shop was disappointing. There are just not many cupcake places off the Strip. And, for those who have been to Vegas, unless you have a car it can be difficult and expensive to get around. Nonetheless, I continued to search until I found a few feasible options. This shop originated in Nashville, Tenn. Gigi has tremendously expanded her business and has several locations throughout the country. I have some great friends in the Tennessee area that were gracious enough to pack some cupcakes with them and bring them all the way to Philadelphia this past summer. My goodness, those were good. But, the other half of the experience is visiting the shop. Fortunately, Gigi’s shop in Vegas is the closest—only 2 miles away from my hotel. Heck, I could get my daily workout by running there, eating a cupcake, and running back. Sweet. I’ve heard so much about them and was introduced to this place via Cupcake Wars. To my great disappointment, they are located 25 miles north of the Strip. That would be a ridiculously expensive cab ride. However, to my great joy, I discovered that they deliver, no order too small, for a flat rate of $20. Beautiful. This place was a little further away, almost not within walking distance. After sitting with the Google Map, I learn that 4 miles isn’t that horrible. Even if I needed to catch a cab, it wouldn’t be that expensive. Check. After narrowing down my options, I’m ready to paint the town red. I’ll be back next week with my full report! Ready or not Vegas, here I come!